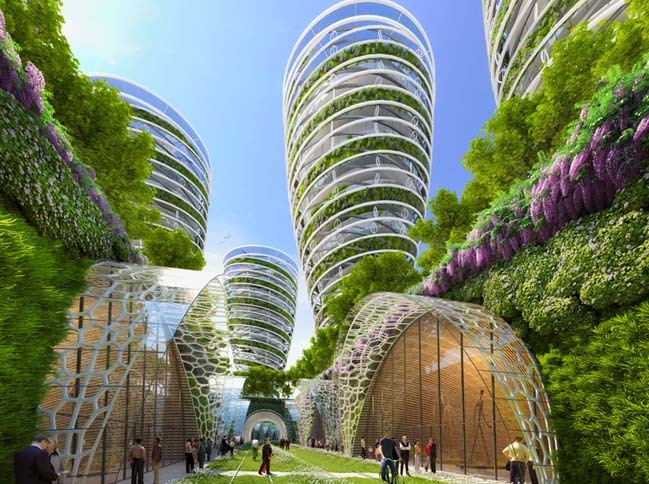 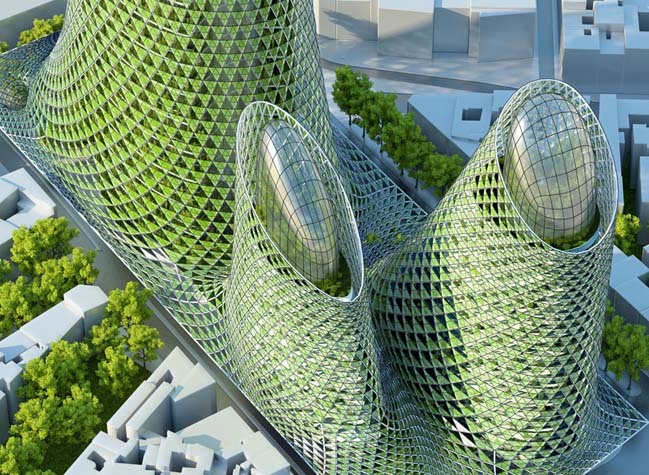 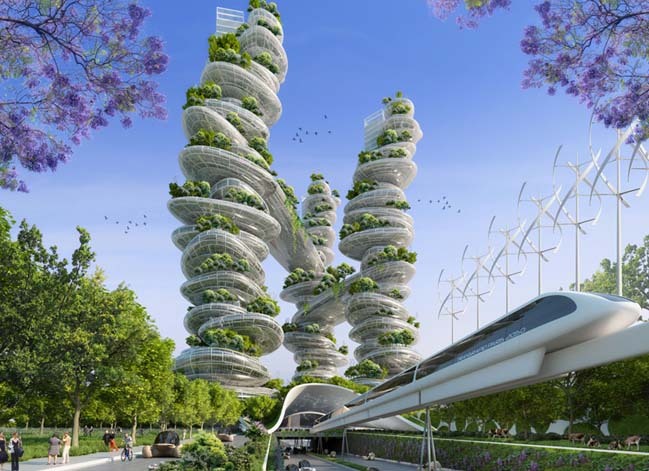 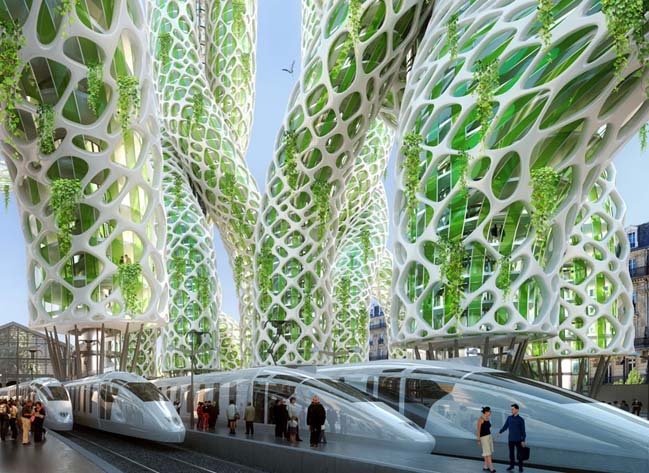 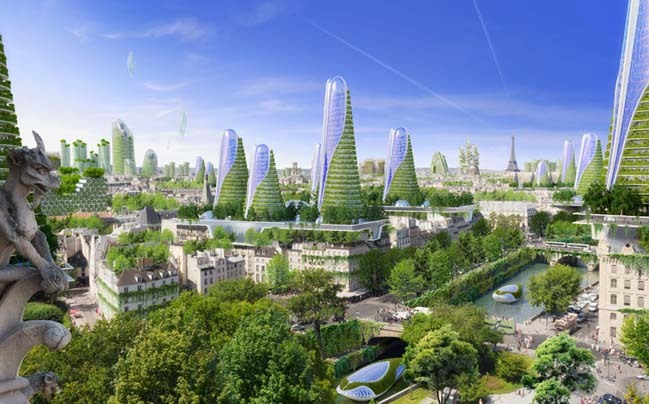 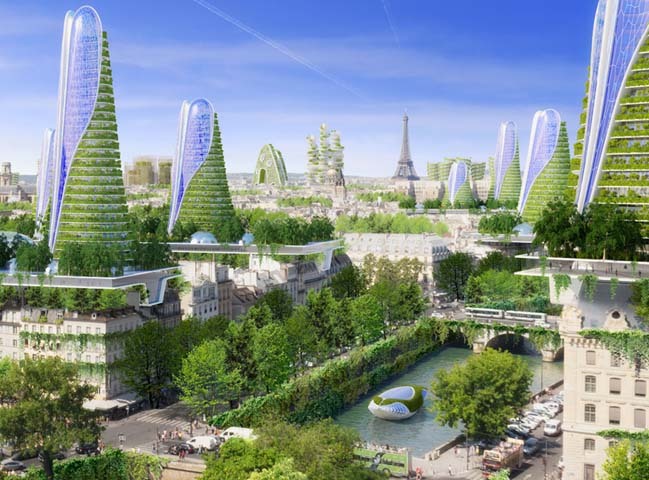 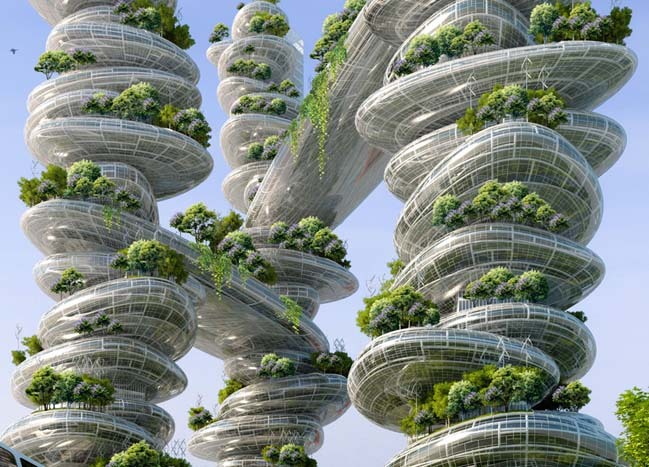 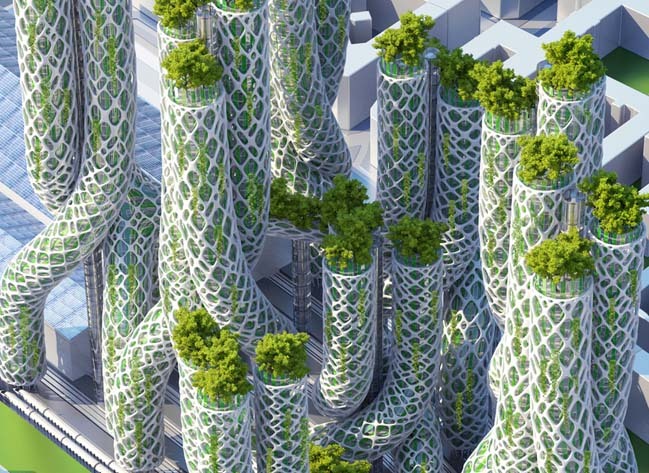 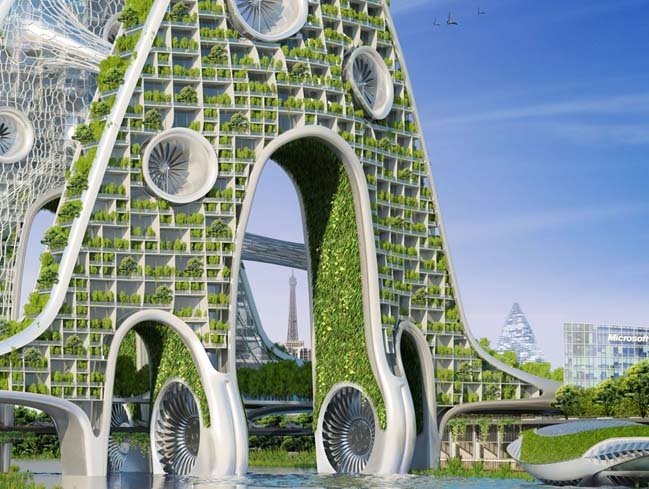 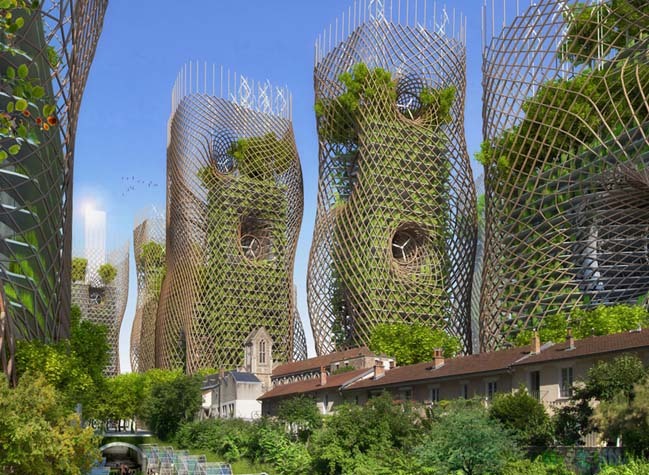 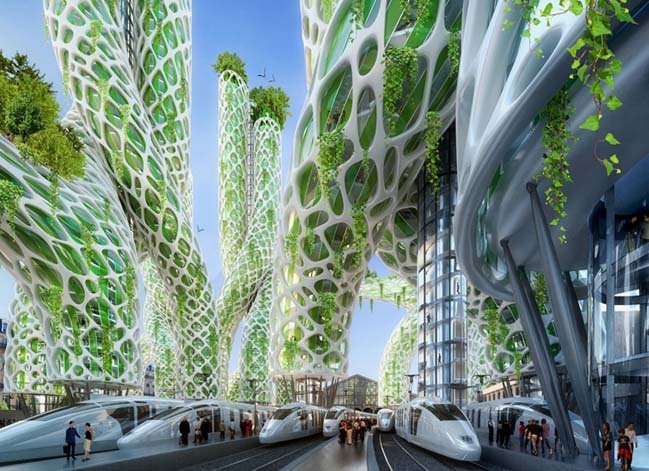 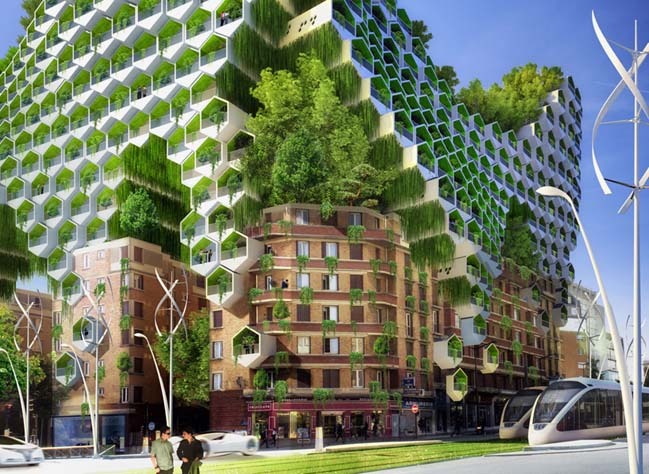 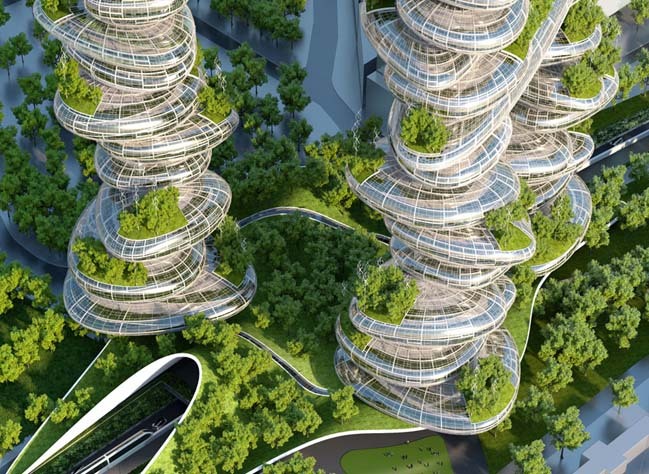 Called "2050 Paris smart city" and designed by Vincent Callebaut Architectures, the entire project represents 8 towers with green and smart architecture with different shapes that are integrated elements of natural and renewable energy for a cities that has dense urban density. 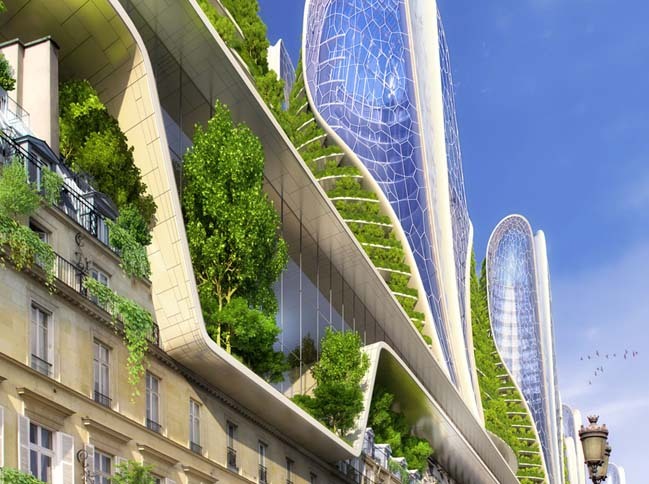 Located on the famous commercial streets of Paris, Rue de Rivoli, the project "Mountain towers" will include a bioclimatic peaks which are integrated a variety of renewable energy into the existing structures. 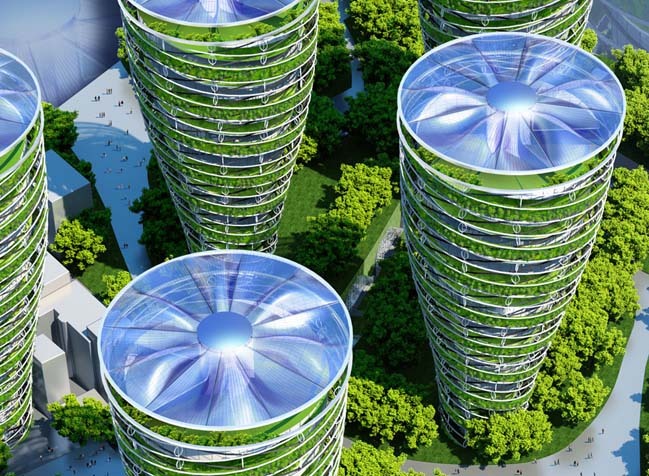 There are three kinds of renewable energy in each tower. 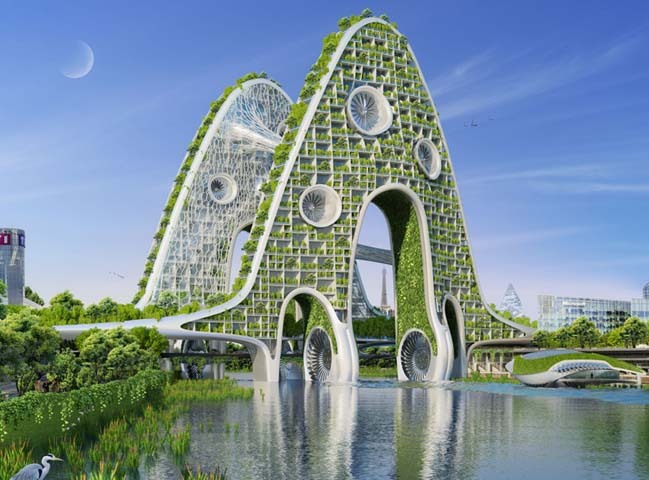 At the day, two giant shields photovoltaic and thermal solar will produce electricity and hot water. 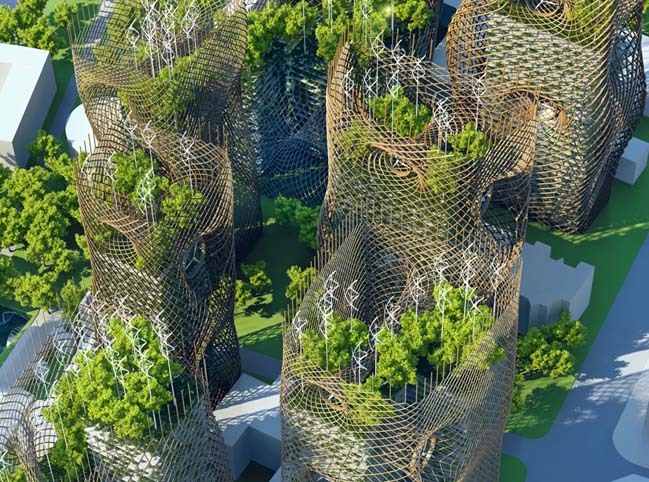 At night, a resersible hydro-electrical pumped storage station will allow an urban cascade flow out from the top of tower to prevent the need of batteries to store the electricity produced. 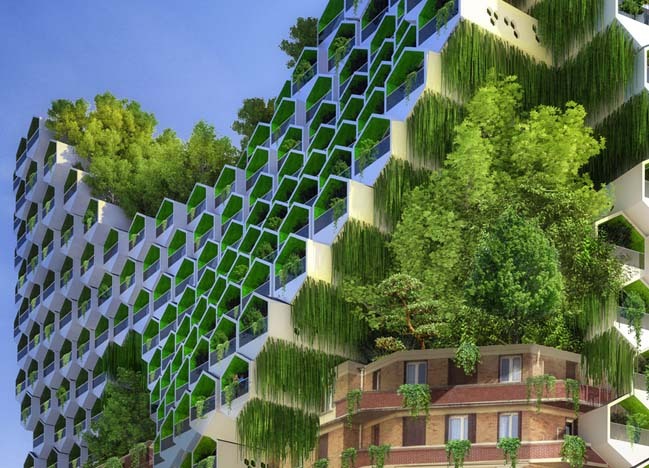 Finally, balcony gardens surround the residential floors and filter in clean recycled water used by inhabitants by phyto-purification and bio-composting. 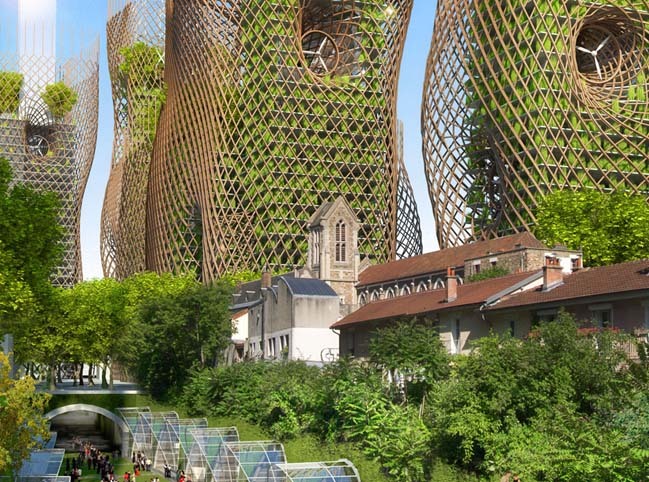 Built as a 23km corridor runs through the center of Paris, Antismog towers will help restructure the railway was abandoned as a public green space. 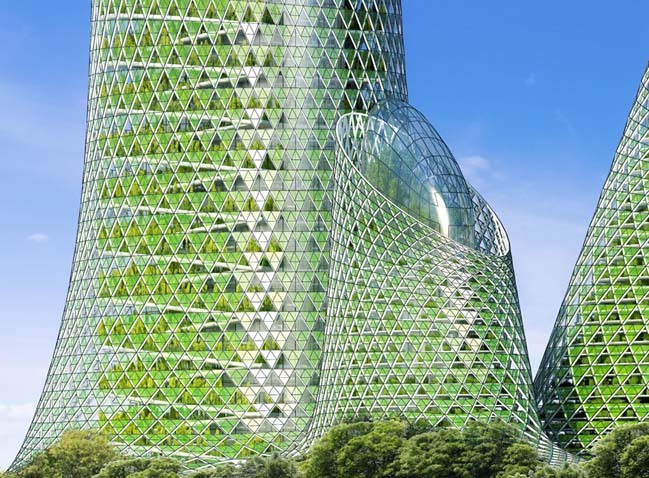 The towers are surrounded by vertical gardens and it also helps to filter the smog in the air and produce electricity through wind turbines are located in the central axis of each building. 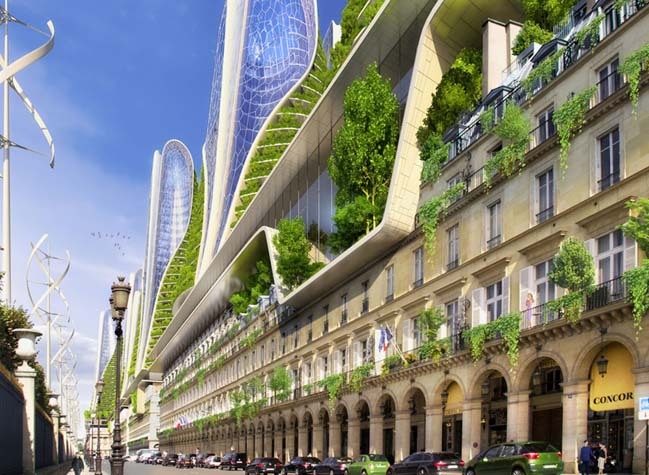 To increase the accommodation in center of Paris, the Honeycomb towers will be built like as additional parts to the exisiting building. 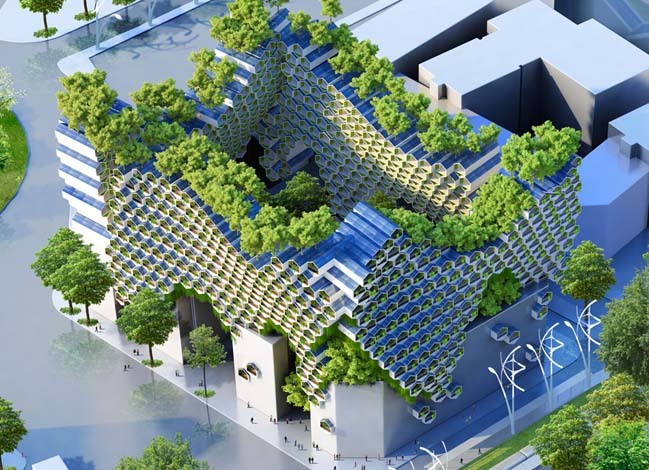 In addition, the roof is covered with solar panels and photovoltaic energy can provide lighting for the surrounding streets. 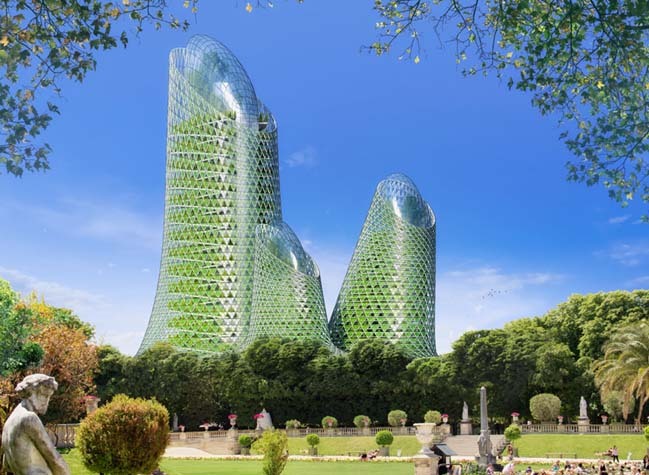 Farmscraper towers are composed of three towers connected each other and has a shape like as stones stacked. 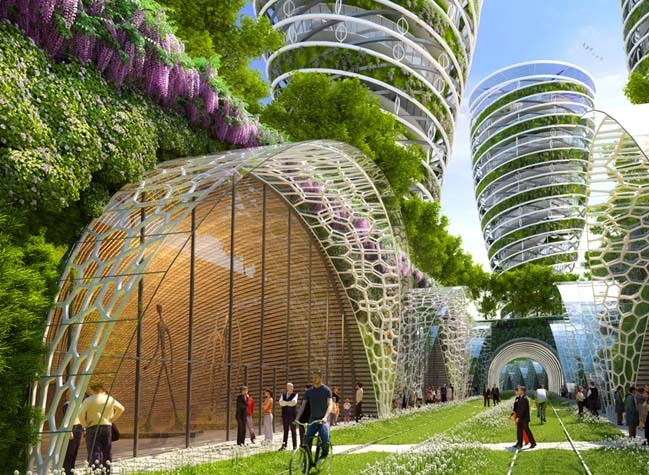 Each tower will be responsible for providing local fresh food with the limited use of pesticides and chemical fertilizers. 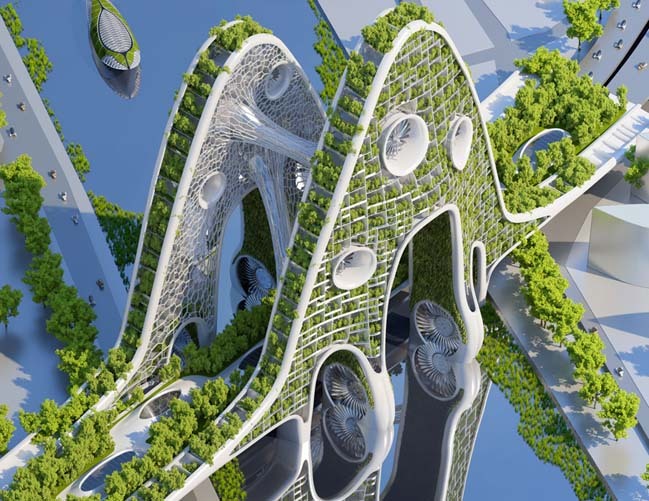 Shaped like a bridge, the Bridge towers have design that are used the kinetic energy of the below river to create positive energy. 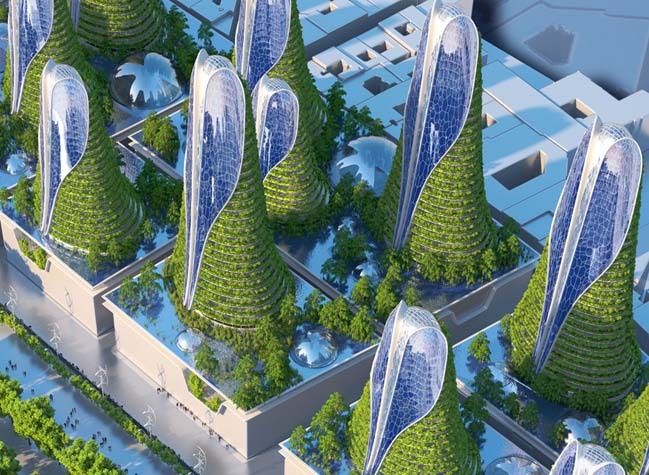 The project will be a new structure for the renewal of a city without carbon and zero waste.